Friend John Nebel and I got an early start from Detroit and drove across Michigan in a thundering downpour. I knew it rained hard in the Midwest but I didn’t know it could last, with such intensity, for so long. It finally stopped near the Indiana border and we were able to stop and start through the Chicago traffic without a drop of precipitation. We stopped in the early afternoon at Miller Park (finally a stadium named after beer instead of a bank or insurance company! ), which is a few miles west of downtown Milwaukee, to buy our tickets for the game. Folks were already lining up to get into the parking lot, which hadn’t opened yet. Puzzling. We later learned why when, after getting settled at our motel, we returned to find the lot heavily occupied by the faithful deeply engrossed in the joys of tailgating. That was a first on this trip. That sense of commitment was reinforced when the national anthem was sung by a Lutheran church choir. 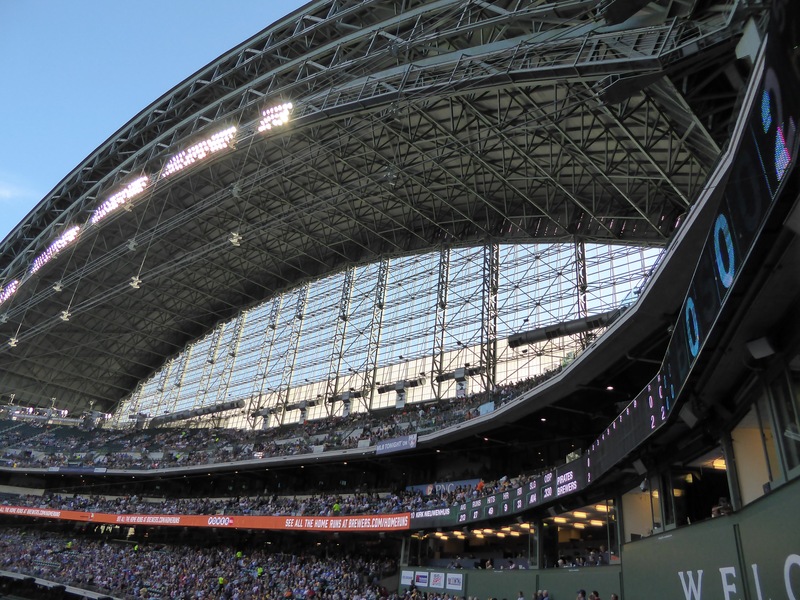 And the Midwestern ambience was further enhanced when, during the seventh inning stretch, everyone sang (after “Take Me Out to the Ball Game”) “Roll Out the Barrel.” Even though this is Wisconsin and not Minnesota, I had visions of Lake Wobegon. Miller Park is an enigma. It was built in 2001, around the same time as so many of the modern era parks, but is the only one with a fan shaped retractable roof. That structure and the walls that support it convey a sense of enclosure, even when the roof is open. The stadium seems small but will hold more than 40,000. Baseball, being rooted in failure (a good hitter – .300 average – fails 70% of the time), depends on hope, and the vista of the outfield with the geography beyond are symbols of that striving. This slightly claustrophobic field diminishes the optimism inherent in the game. I didn’t love it. The game itself frankly wasn’t very interesting. I had not heard of a single Brewer in the starting lineup (Lucroy was held out pending a possible trade, Braun recovering from a minor injury). This was the second time in a week I’d seen the Pirates, but they didn’t have the offense I saw in Pittsburgh. 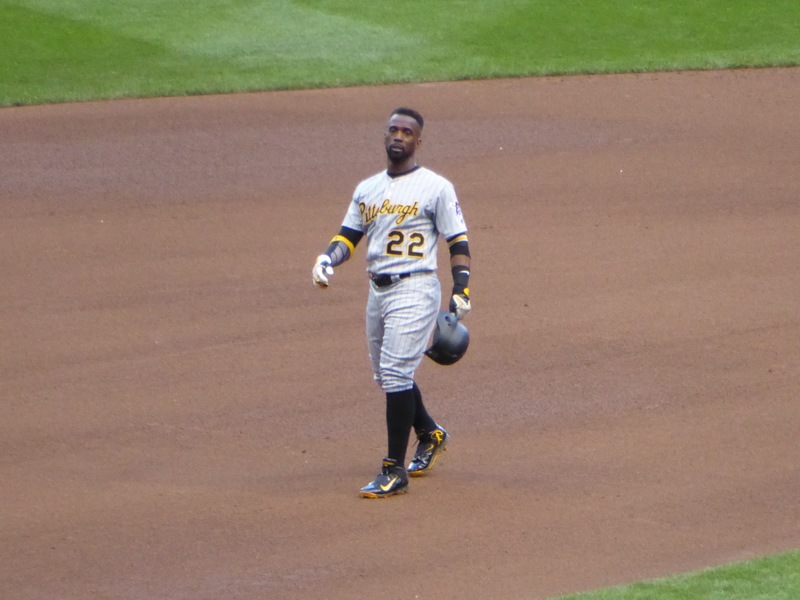 Perhaps it was because Andrew McCutchen has lost his locks, a fact I had completely missed in the prior game (who is the Delilah to this Samson?). Or more likely just a night typified by the Pirates rookie pitcher getting his first hit to right only to be thrown out at first for failing to hustle down the line. Brewers won 5-3. And of course, ballpark food. I have been dreaming of the wonderful bratwurst awaiting me in Wisconsin. This was the appointed day when I would reach baseball culinary nirvana. It didn’t happen. The brat was serviceable but uninspired. It didn’t hold a candle to the one I had at Target Field in (here we go again) Minnesota last year. No sautéed onions or peppers. Just a ballpark meal that will not engender fond memories. The Leinenkugel Summer Shandy was a nice counterpoint though – a light German Weiss with a refreshing hint of lemon. The only unusual item on offer was a donut and custard sandwich – I’m not that courageous. Now a word about groundskeepers. Every ballpark has them, of course, and we see them watering and grooming the infield, laying down the lines and occasionally doing a dance during the in-game spiff-up (I have yet to see that on this trip). But before the game, during the team’s road trips, in the off season, they are busy as well, insuring that the grass is healthy, that the infield is level, that conditions will be ideal for every game so that the skill of the players won’t be thwarted by the bad bounce off a stray rock or a slip in a wet spot in the outfield. Milwaukee’s crew moved at a trot – faster than any other so far. Here are pictures of groundskeepers in several stadiums doing their their pre- and mid-game duties. 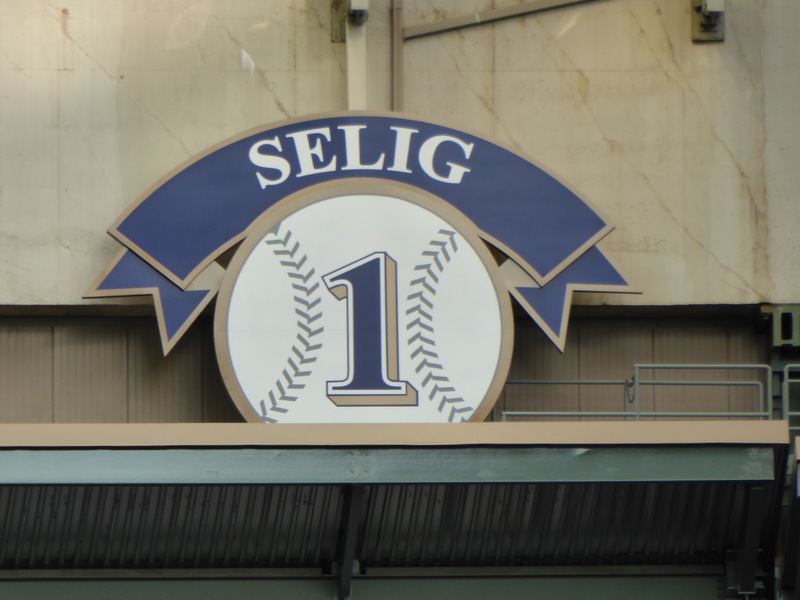 By the way, while it is tradition to display the names and numbers of a team’s greats from yesteryear on the stadium walls, who knew that recently retired baseball “commissioner-for-life” Bud Selig was a Milwaukee Brewer or that he had a number (let alone a uniform)?? ?